By Mark J. Donovan I was up at my summer home this weekend and saw that the snow had finally cleared from my mahogany surfaced deck. Fortunately the deck held up very well over the winter, even though we probably got a total of 6 feet of snow. All it needs is a spring deck cleaning to ready it for the warmer weather. I’m very happy with my decision a couple of years ago to go with a semi-transparent stain on the last go-around with the decking. Previously I had used deck sealers and all of them ended up looking pretty shabby after a couple of years. They peeled, formed dark stains and overall just looked crappy. So on the last go-around, I sanded the entire deck surface and used a semi-transparent stain on it. It took a couple of weekends to do the project, but the results were stunning and the deck has held up nicely. There’s no peeling and the color has remained consistent. All I plan to do in the next couple of weekends is do a spring deck cleaning on it with a mild detergent, water and a long handled brush. I wish that was all I had to do for the deck at my main home. It looks like I am going to be forced to replace the decking and railing material. The decking is Mahogany there as well, however I used a finishing nail gun and galvanized finished nails to hold the decking boards down until I installed the stainless steel screws. The galvanized nails have corroded and left stains on the wood that I cannot remove. For the deck railing system I used pressure treated lumber. It has warped and twisted and looks quite shabby. So that’s one of my many projects later this spring or early summer. If you have plans to build a deck, make sure to check out my Deck Installation Bid Sheet. It will help you find a quality decking contractor and give you valuable tips on how to ensure a quality deck construction. This weekend I spent a good part of it disassembling my above ground pool. This winter simply was too much for it. One day in late January, I looked out the window and my pool had collapsed. The top sides had simply caved in. The reason….it’s complicated. Basically I could not keep up with the 3.5 feet of snow that fell that month, and as a result, the pool liner broke. When it did, the water drained out of the bottom, the 18” thick ice disk sank to the bottom, and the pool cover tied to the top sides of the pool with a wrap-around-wire sagged downwards. As the heavily snow laden pool cover sank towards the bottom of the pool, the wrap-around-wire pulled in the sides of the pool. Suffice it to say the pool was a total loss. As a result, I spent most of Saturday disassembling the pool frame and taking it to the local dump. Unfortunately, due to the large disk of ice still in the bottom of the pool I was unable to remove the steel shell of the pool and the pool liner. I’m hoping in the next couple of weeks to be able to remove these items. Once that’s done, I’ll debate putting in a new pool. My advice to anyone that owns an above ground pool in a northern climate is to make sure not to use a wrap-around-wire for holding down the pool cover. Instead use clips or milk jugs filled with water and tied every few feet around the perimeter of the pool. This way if the pool liner goes, your pool frame will not be damaged. Review of Guy Kawasaki's lastest book - "Enchantment: The Art of Changing Hearts, Minds and Actions"
I just finished reading an advanced copy of Guy Kawasaki’s latest book “Enchantment: The Art of Changing Hearts, Minds and Actions”. It was a fantastic read as it was filled with practical advice on how to thrive in both the corporate and non-corporate worlds by influencing and enchanting others. This book is a valuable resource for students, employees, management, entrepreneurs, and non-employed people alike. “Enchantment” addresses all aspects on how to conduct one’s personal and professional endeavors so that they can capture the hearts and minds of others, and to create win-win situations for all parties. From reviewing simple but important issues on how to dress and greet people, to using the latest in push/pull social media technology, Guy explains how to use many techniques and tools to help sell oneself and to enchant others. As the owner of a small web-based business I found myself taking copious notes while reading “Enchantment” and implementing many of his social media technology suggestions after completing the book. Via multiple examples throughout the book Guy explains how extremely successful companies achieved their successes by not only producing quality products but by also going a step further and enchanting its customers and supporting its customer communities. “Enchantment” also goes beyond just teaching skills on how to influence others. It explains that at the core of any product, business, or goal there should be a fundamental objective to make the world a better place for all. I highly recommend reading this book if you have a vision or goal that you want others to buy into, be it obtaining a promotion, starting a business, or simply getting your kids to do what you ask. HouseSight continues to attract new members everyday who are posting pictures and descriptions, and even embedding videos of their home improvement projects. Why not you? See HouseSight to register today and start showing off your home remodeling projects and skills. Its fast, fun and free. Not only does HouseSight allow you to post information about your home remodeling projects, it's also a social networking website that allows you to communicate with other fellow members to ask questions about their home improvement projects. In addition, you can vote on the projects you like best to let everyone else know what are the coolest home improvement projects on HouseSight. You can also rank your own home remodeling contractor to let the world know who to hire and who to avoid. So again, sign up today and start sharing your home improvement experiences. Last week Google updated its search engine algorithm to the detriment of many popular and successful websites including HomeAdditionplus.com. HomeAdditionPlus.com lost 25-30% of its traffic virtually overnight, while other folks like AsktheBuilder.com, and Ezinearticles.com have lost over 50% of their traffic. Hundreds of other quality websites have lost much more. The news was so negative that the Wall Street Journal wrote two articles on this subject earlier this week. Google’s latest Search Engine Optimization (SEO) update is referred to in the industry as the “Farmer” SEO update. Google has communicated that the main purpose of this update was to clean up the high number of giant content farm mills out on the internet that scrape, copy and put out hundreds and thousands of low value content webpages each day. I commend them for wanting to do this. Unfortunately, however, some of the same websites that use these tactics survived this SEO update, while other quality and long established websites got the shaft. See Google’s webmaster forum to see the hundreds of webmasters that have been filing complaints and pleading for reconsideration over the past few days. Companies are now laying off employees and online businesses are going bust all due to one company, Google. The true winners in this shuffle of the deck chairs appear to be the big companies such as Sears, Google Shopping division, Amazon, Ikea, HGTV, Britannica, Facebook, MarthStewart, etc. Unfortunately these sites, with the exception of Facebook, are exclusively about selling you products rather than providing you with free information and answers that save you time and money such as HomeAdditionPlus.com. Don't expect Google Shopping, Amazon or Ikea to respond to your email questions unless you have a credit card in hand. Even more amazing is that some of the websites that are notorious for puttting out low value content survived this Google Cyclone, such as eHow.com. What really galls me is the fact that ehow.co.uk has almost a 1000 useless back-links to HomeAdditionPlus.com (rel=nofollow links) as a referenced source for their watered down content on a sujbect that I wrote about. To that I say, thanks for nothing eHow.com and Google! I urge Google to wake up and realize what they have done. Its a travesty to both the consumers and hard working people who have spent years trying to provide quality help to people. I hold out a glimmer of hope that Google will do the right thing and reconsider what it has done. As a matter of fact, I have some evidence that suggests that this may already be happening. I have been using Google Adsense since 2005, and low and behold two days ago when I log into my blogger account I get a Google Pop up saying this blogsite looks pretty popular and that maybe I should consider using Adsense. Its ironic on two levels. First this blogsite and HomeAdditionPlus.com have been using Google Adsense for years, and second this is the first time EVER that they have sent me anything about signing up for Google Adsense. Maybe even Google is feeling the hit in their wallet for their latest actions. They appear so desperate they can't even take the time to figure out what publishers are using Adsense on their own blogging service before sending out a spam advertisement. I finally got around to using some new tools to create good looking Ebook covers. 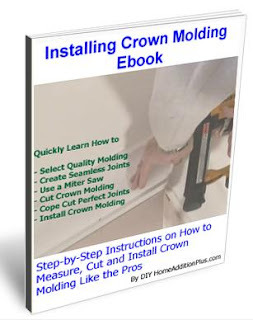 The Installing Crown Molding Ebook has been a popular product over the years at HomeAdditionPlus.com, but maybe with this new cover look even more potential customers will agree! Actually the new tool was an old tool that I've been using for years, Photoshop. I just found some useful online tips to create professional looking Ebook covers using Photoshop, and a couple of ebook cover templates that I downloaded for free. In less than 3o minutes I was able to create this ebook cover, and most of that time was playing around with the creative artwork. For more information on how to install your own crown molding see: "Install Crown Molding Ebook"